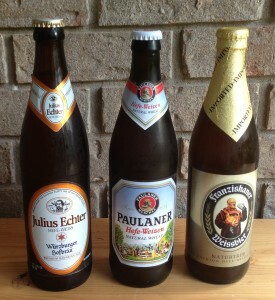 Wheat beers are highly carbonated through bottle conditioning. This is the sixth and final part in a series on German wheat beers. The first part was posted September 3rd. There was also a chemistry supplement and two example recipes — one all-grain, one extract. Once your wheat beer is fermented, it’s time to package it. Most commercial hefe-weizen is bottle conditioned. A few breweries keg their beer, but it can be difficult to dispense a beer that is so carbonated. In his book, “German Wheat Beer” (1992, Brewers Publications) Eric Warner gives the range of carbonation in wheat beers as 2.8 to 5.1 volumes of CO2, with the average being 3.9. This carbonation floats the foam on a wheat beer, which is more voluminous than most other beer styles. It also, obviously, makes the beer taste somewhat fizzy and gives it a bit of a “bite” (which was recently discovered to be from carbonic acid). The simplest way to get this level of carbonation is to prime the beer with corn sugar, as is standard practice for bottle conditioning homebrew. Consult a carbonation chart to determine how much residual CO2 you have and how much you need to reach your target level. For example, if you ferment at 65 °F (18 °C), you would have 0.89 volumes residual CO2, and you would then need about 9.25 oz. (262) g of corn sugar to reach 4.0 volumes of CO2 in 5.0 gallons (19 L) of beer. Priming the beer with fermenting wort can be tricky, so it’s more prudent to simply prime the main beer with wort. You can add then some lager yeast if desired, or let the fermentation strain carbonate the beer. How much Speise should you add? There are a couple different ways to approach this. I like to think of it this way. If you add priming sugar, you will boost the specific gravity of the beer slightly, then the yeast will consume it completely and the specific gravity will return to what it was. (Actually very slightly less because alcohol is less dense than water.) However, wort is not 100% fermentable, so you can’t just substitute malt extract for corn sugar and get the results you expect. What you need to do is to find an amount of malt extract (or volume of wort at a certain specific gravity) that yields a specific gravity drop equal to what you would get by adding the appropriate amount of priming sugar. And here’s an easy way to do that. Find out how much priming sugar you would need (from the carbonation charts). Now, type this amount into a homebrew recipe calculator and see what the OG of water plus this sugar would be. (You can lower the batch size when doing this for better resolution.) Now, by trial and error, type in amounts of malt extract until you get one that would yield a gravity drop equivalent to the “OG” of the sugar water. For example, let’s say you added 9.25 oz. (262 g) of corn sugar and the OG of your sugar water (in one gallon/3.8 L) was 1.021. By trial and error, I see that 10 oz. (280 g) of dried malt extract in the same volume yields an OG of 1.028 and an FG of 1.007 (at 75% apparent attenuation) — a drop of 21 “gravity points.” So, this is the amount of malt extract needed to make your Speise. If you are priming with wort, calculate the volume of wort that could be made with this amount of malt extract at the original gravity of your beer. By trial and error (varying the batch size), I see that 10 oz. (280 g) of dried malt extract would make 0.58 gallons (2.2 L) of wort at SG 1.048. So if I’m priming with 1.048 wort, this volume would be what I need. To prime, either mix the sugar or extract in hot water and hold above 170 °F (77 °C) for 5 minutes or heat your reserved wort to 170 °F (77 °C) and hold for that amount of time to sanitize. Cool your priming mixture and add it to your bottling bucket, siphon the beer into it, stirring the mixture thoroughly. If you’d like, add lager yeast. For 5.0 gallons (19 L) of 12 °Plato (OG 1.048) beer, you’d need 2 g of dried lager yeast or roughly a third of a Wyeast or White Labs tube. Bottle the beer and let it condition at “room temperature” or slightly higher (but don’t exceed 77 °F/25 °C). After a couple weeks, chill a bottle overnight and see if it is carbonated. Move the rest of the beers to cold storage if so. Because of the high level of carbonation, it’s best to bottle in heavy bottles. The bottles that wheat beers come in are — of course — ideal for this purpose. Very informative , thank you BUT ; I will not have 5 gal. of brew after I transfer . Bottling (30 day ferment) directly from glass carboy ……. I’ve got approx -1 gal. …….of crud at bottom of carboy . So do I deduct / subtract 20% from this secondary priming equation ? I’m fermenting 5 gal. of German Hefeweizen ( 6.6 lbs. Munson’s malt extract with 1 lb. specialty grains ; flaked wheat / flaked Oates) @ exactly 60 degrease . So ; will 5 oz. of dextrose do it for me for a decent end product (carbonization) ? Thanks . Why in the world are you fermenting for 30 days mate? Wheat yeast is quite quick and Hefes should be enjoyed young. Never ran a hefe past 10 days.